Passengers are welcome to board our ship at 6:00 p.m. After comfortably settling into your cabins, we'll introduce our crew at a welcome cocktail before dinner. Join us on a guided tour of Bordeaux by night. The morning will be spent cruising. This afternoon, join us on an excursion to the Medoc along the Grands Crus Wine Route (must be booked prior to departure at your travel agency). Enjoy an evening of onboard entertainment. This morning will be spent cruising towards Blaye. Its citadel built by Vauban is undisputedly Blaye's major attraction today. Join us on an excursion by coach along the Route de la Corniche Fleurie before we visit the citadel. We'll return on board and cruise to Libourne. Tonight is our gala dinner and evening. Join on an excursion to Saint-Emilion. We'll return on board and cruise to Bordeaux. Tonight is our special New Year's Eve dinner and evening. For navigational safety reasons, the company and the captain are the only authorized persons who can modify the cruise itinerary. Alcohol can be harmful to your health. Please drink in moderation. 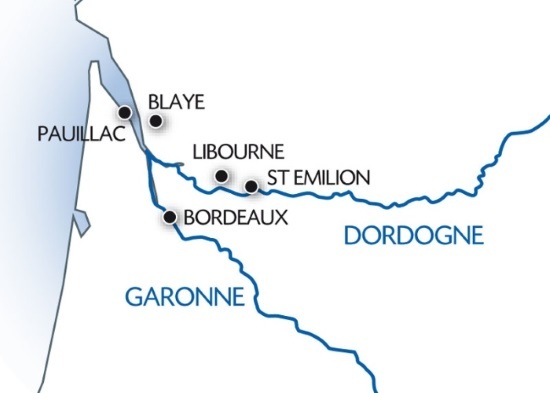 (1) Depending on docking availability, the stopover in Pauillac may be replaced by Cussac-Fort-Médoc and Libourne by Bourg.